Throughout my years of meditation and mindfulness training, I have picked up some important tidbits that help me get the most out of each time that I sit. Some of these pointers have come from 40-year monks that I have lived with during my time an ashram. Some have come from books and lessons I have read written by yogis, monks, saints and sages. Lastly, some have come from my own practice, which were found through trial and error. Here is the third tip… I hope it helps with your practice! 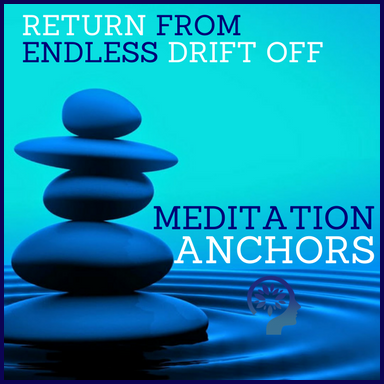 When I sit… I make an anchor to return to if I drift off into endless thoughts. The breath is a great tool to use as an anchor, because it is always there and has been the focus of many meditative practices throughout time. It should be something that not only brings you back to the present moment, but also reminds you of what you are doing. In my mindfulness training, along with the breath, my favorite is the sound of… me. I try to listen to what is happening inside my head. Sometimes it is quiet, which is calming, but other times there is a tone that seems to always be there. Listening to that tone at length can lead to some deeper experiences and realizations. Using an anchor is really giving your mind something to focus on. Without an anchor, it is very hard to get your mind to quiet down. It is similar to using a laser pointer to get a cat’s attention… it becomes very intent on catching the laser. The mind needs a laser. It needs a focal point. Since there are different techniques of meditation, it is important to find which one works best for you. There are some techniques that you will find easier than others, and this comes from your mind’s ability to focus during the seated practice. The Consciously Meditating program is designed to walk people through a step by step process of finding what meditation works best for them. Whatever your anchor turns out to be, use it. We are headed for the top of the mountain, but we will all inevitably walk a different path. If your anchor becomes your breath, fantastic! The anchor can be something that you use throughout the day to deepen your mindfulness training. Meditation is not just for when you sit, it is about taking that state of presence with you everywhere you go… and the anchor is how you stay aware of it! This blog is the third in a series where I give tips that I have gained from my time meditating throughout the years. Check out the next blog here: Links to Overcoming Your Ego in Meditation.